Shamrock table runner features green chenille material. This Irish table runner with shamrocks would make an ideal accent to any flat surface. 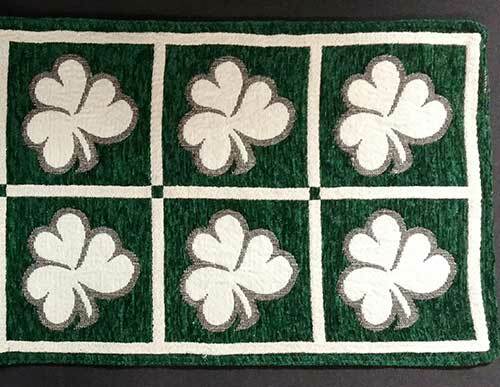 This Irish table runner features a repeated white shamrock design contrasted by the green base. The shamrock table runner is made of chenille and measures 13" wide x 36" long. This Irish table linen is received with a shamrock history card, complements of The Irish Gift House. Shamrock accent rug is a slice design that features woven chenille material. This Irish table runner features shamrocks. This Irish table runner features a green on green design with shamrocks. Shamrock table runner is reversible and features an Irish motif on both sides.